Whisk flour, sugar, baking powder, baking soda, oats and salt together in a small bowl. Combine mashed bananas, butter, milk and eggs in a large bowl. Add dry ingredients to wet ingredients. Stir until completely combined. Pour into a well buttered loaf pan. In a small bowl combine streusel topping; flour, brown sugar, oats, cinnamon and salt. Use your fingers to mix in the butter until everything is combined. 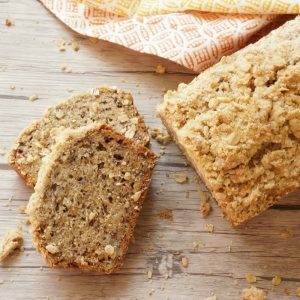 Again, use your hands to crumble the streusel over the banana bread dough. Bake in a 325°F oven for 1 hour. Until skewer inserted in the middle of the bread comes out clean. Remove bread from pan and let cool on a rack. The bread can be frozen at this point and be thawed at room temperature at a future date. We often bake 2 loaves at a time – one to eat and one to freeze.